"The kids learned a lot and were very impressed by your artwork. We appreciated how prepared you were!" I love to talk to kids about my books and about how I created the illustrations. I bring in sketches, props, and actual art from the books. I usually close my visit with a book sale and signing for the students. I present to students in grades K-8, but 2nd-6th grade is ideal. New topics can also be created based on any of my books. 1) "Nature's Paintbox: A Seasonal Gallery of Verse"- poetry, the four seasons, and art mediums. 2) "The Can Man"- homelessness and charity. 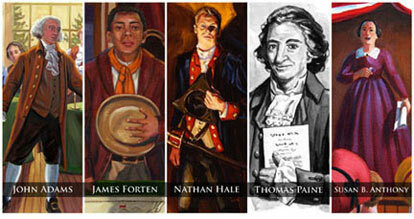 3) "Voting and Democracy"- with various biographies of important figures in American history. 4) "Survival in the Snow"- an historical true tale of adventure about Moses Schallenberger. My programs vary and can be tailored to a specific audience and subject matter. 1) One popular presentation is on my book “Natures Paintbox: A Seasonal Gallery of Art and Verse”. This picture book is a beautiful descriptive poem about the four seasons rendered in a different art technique for each season. As the illustrator I think this is a great tool to teach students about art mediums, poetry and nature. During program I talk about the process of creating the art from the sketch phase to the final illustrations. Also comparisons are made between each season and its related art medium. I have lots of visuals to share like originial sketches, photo reference and actual art. It’s a real hands on program where students get to create a finished piece of art in watercolor just like in my book! My process of illustrating is also covered. Go to this link for more information about a presentation based on this book. 2) With my picture book "The Can Man" I talk to students about the issue of homelessness, a child's desire for possessions, the difference between wants and needs and how these issues relate to the characters in my book. In the story a young boy to earn money for a skateboard decides to collect and redeem empty soft drink cans, but ends up giving away his money to help a local homeless man. I also share my process of creating art from the sketch phase to the final illustrations. An art exercise for the kids ends my talk and food donations can be brought which will be donated to a local food bank. This topic is very relevant in todays tough economic times. 3) Another topic covers the theme “Voting & Democracy". Using my books on Susan B. Anthony, James Forten, Thomas Paine, Nathan Hale and John Adams I show how these various individuals representing different genders and races contributed to democracy. I share interesting facts about the subjects and the age they lived in. This is a great topic after election year 2008. Also in the program I share my process as an illustrator creating art from sketch phase to the finished book and at the end I give students an assignment to come up with their own illustration. In this program I bring lots of visuals from originial sketches to actual art. 4) For my book "Survival in the Snow", a real-life survival story set in the 1840's in California's Donner Lake region I tell the amazing story of young Moses Schallenberger and his time spent alone in a snow bound cabin. I also share my process of creating art from the sketch phase to the final illustrations. An art exercise for the kids ends my talk. The presentations are roughly 30-45 minutes with around 30 minutes for the kids to complete the art exercise. $225 by the hour and $750 for a full day depending on the group size and distance to travel. I am open to negotiation. Usually 4 presentations is my maximum per day. Member of The Society of Children's Books Writers and Illustrators International and Western Washington. "Gifts From the Enemy"- 2015 gold level Benjamin Franklin Award- Independent Book Publishers Association nonfiction category (8-12 years); 2015 Gelett Burgess Children's Book Award in World History; *Starred review*- Jewish Book Council; 2015 Read Aloud Comstock Honor Book- Minnesota State University Moorhead; 2014 Spirit Book Award honor book nonfiction category- Oregon Council of Teachers of English. "The Can Man"- 2011-12 Pennsylvannia Keystone to Reading Elementary Book Award, Intermediate level; 2012 Charlotte Award (state of New York), Intermediate level; Smithsonian Magazine Notable Book for Children in 2010; 2011 Horace Mann Awards Honor Book; 2011 Paterson Prize winner. 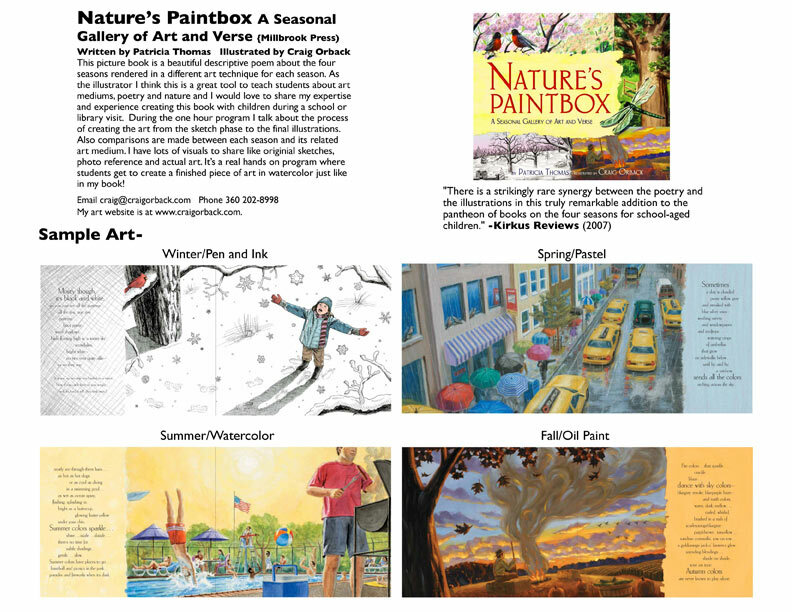 "Natures Paintbox: A Seasonal Gallery of Art and Verse"- Book Links Lasting Connections of 2007 title- American Library Association magazine; Best Children’s Books of 2008- Children’s Book Committee at Bank Street College of Education; Editor’s Choice- Library Media Connection. "The Flyer Flew! "- Best Children’s Books of 2007- Children’s Book Committee at Bank Street College of Education. Keeping The Promise: A Torah's Journey"- Suggested reading list- New York Reading Association; 2005 Teachers' Choice Award- International Reading Association. "Benjamin Banneker: Pioneering Scientist"- 2003 Outstanding Science Trade Books for students K-12- National Science Teachers Association and the Children's Book Council.